“You want a story carnal? Have a seat right here. You seem like a firme vato so I’m gonna hand you one. I’ll get straight to the point. In 1982 my carnal Simon (see-mon) was falsely accused of murder. His name ain’t really Simon but todos en la vecinadad called him that. He’s in the pin, and has been there for treinta y cuatro and counting. The justice system in the states is down right dirty. Without a doubt he doesn’t deserve to be behind bars. Without flinching, Simon is the smartest man I’ve ever known. Back in 82′ when he was 20, he packed completely as a man. I looked up to him and still do. I mean his estilo was second to none. The Penguin line dominated his attire. He also wore the Florsheim and Pendleton lines. His way of speaking captivated a todos. He read and he studied everything. I mean all the rucas lined up for him, he was carita (handsome). I looked at him with great respect and admiration. Not even the homies messed with him. I was in awe of the kind brother I had. He took me under his wing. I’m 6 years younger than him but he always took me with him everywhere he went. His body language demanded respect and no one stepped over his linea. Most of all, he was the humblest person anyone could ever meet. He gave rides to everyone. People would ask him “Simon, can I get a lift?” He answer was the smoothest, “Simon que si.” That’s how he earned his nick name. He became the Taxi driver for the Boyle Heights neighborhood and that’s partially how he made a living. Simon also worked for a white man named Patrick Harrisonburg. It is there where he learned how to become a man. Patrick was a Jewish immigrant who flourished as a mechanic at a shop he owned on 4th street. Patrick taught him about posture, about the proper way of speaking but mostly about how hard work could pay off in this country. Sure we had our jefito (father), and he worked hard but for what ever reason Patrick really shaped my carnal Simon. You see this ranfla (car) right here? Patrick made Simon earn it. It’s a 1959 Impala. It was in fair condition when it became his official ranfla. From that point on, he poured his heart and soul into it. Any classic car addict can tell you this: it’s what we do, its a lifestyle and bloodline. Simon soon met a black girl in Watts. She lived at the Imperial Courts (projects) on Imperial Hwy. She was a beauty just like him. I remember we’d go crusing por todo Los Angeles, especially on Whittier Blvd in East Los on Sunday evenings. Those times were a toda madre. Simon was on a natural high. His girl, his ranfla and L.A., it was his. My jefitos (parents) weren’t too happy about him hooking up with a black haina (girl). They gave him a hard time and I always got in the middle of the scuffles. One day some vato from the projects got killed and Simon happened to be around the area. With him being chicano, owning a 59 Impala and having a black girlfriend, it was a total red flag. To make a long story short, he got canned. His girl Nisha gave birth to Simon’s daughter while he was in the pinta. She named her Nomis which means Simon backwards. Nisha soon became a hype (drug addict) and lost the baby to the system. The streets took Nisha, she became lost after his imprisonment. We know nothing of her today. My jefa had a hard time with it all but the family pulled together and we were able to adopt Nomis. Through hard work and perseverance, my wife and I were able to get full custody of her. She is now a grown educated beautiful black chicana woman with her own family. We all go visit Simon twice a month. He’s in good spirits but I see his sunken look. His joy is when his eyes are set on Nomis. He’s 55 now, and looks defeated but we’re still fighting to get him out. Patrick passed away 3 years ago while continuing to fight for Simon’s freedom. My dream is to see Simon cruising down Whittier Blvd with Nomis. Los Angeles stories through an alternative lens. 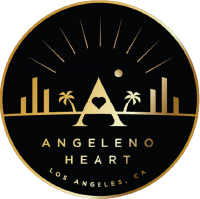 Angeleno Heart was started with the thought of capturing pictures and telling a story.